Since his wife's death at sea, San Francisco Police Detective Michael O'Higgins has been paralyzed by grief and shame - unable to care for their teenaged daughter, who saw her mother swept away, and unable to deal with the daily requirements of his job. Almost a year after his wife's death, O'Higgins takes a ferry ride as part of his therapy for post-traumatic stress disorder. On the boat, he meets a charming Indian family: successful young husband, two lovely daughters, and a kind, beautiful wife and mother. O'Higgins has no idea that he will meet this woman again on his first day back after bereavement leave, when he and his partner are called to a Nob Hill mansion to investigate a homicide. The victim is the handsome man O'Higgins met on the ferry, and his wife, Asha Chaundhry, is the obvious suspect. Asha Chaundhry becomes the center of O'Higgins' investigation. The victim's father, a prominent Indian politician and business tycoon, is anxious to keep his son's death out of the public eye, and to have the investigation resolved as quickly as possible. As O'Higgins digs into the Chaundhrys' business and political dealings, he becomes convinced of Asha's innocence, while her father-in-law seeks to isolate her from friends and defenders, even sending her children back to extended family in India. Increasingly desperate, Asha turns to O'Higgins for comfort, in a way that threatens both his recovery and his career. 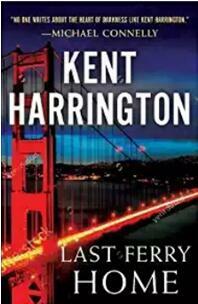 Kent Harrington is the author of numerous acclaimed novels, including The Good Physician, which was named as one of the best novels of the last ten years by Booklist, Dark Ride, Dia de los Muertos, and The American Boys. Of Dark Ride, Michael Connelly said, "It reads like Jim Thompson interpreted by Quentin Tarentino."